The Troika technical team was chased from their Greek offices on Tuesday by an angry mob of Muni workers (who proclaimed that “they got our labor rights and conditions back to the Middle Ages”). As KeepTalkingGreece notes, this is the third incident in 24 hours as since the team arrived they have had water bottle thrown at them as well as cars kicked and ‘hurled coffees’. The clip below shows the Troika member looking rather anxious as he runs from the crowd (and NewsIt reported a female Troika member seeking refuge in a bookstore). It is not just the municipal workers who are in fear though, as GreekReporter notes the unbelievable story of the re-appearance of a ‘mysterious’ CD containing the names of 2000 ultra-rich Greek Swiss-bank account-holders is now back in the hands of the Greek government as they press for bilateral taxation on those huge deposits. It seems rich and poor alike are not happy with the Troika’s exposure of tax cheats across the desparate nation. I’ll give the Greeks one thing at least, they are not going to just lie down and die. They are fighting !Unlike the Irish, we are already on our knees and looks like we are going to stay slaves for a long time !let,s hope we will get some inspiration from the Greeks and learn to stand on our own two feet and start the fight to take back our country from the puppets and collaborators of the troika Dictatorship who are sucking our country dry. Ireland get up off your knees and fight back! Time for Greece to Bring Back the Drachma? 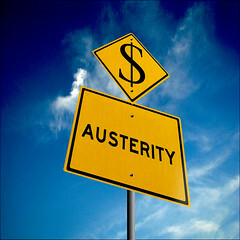 Five years into an economic depression of epic proportions, one would have thought that the Greek government should be raising serious doubts as to whether the oft-repeated troika recipe of severe fiscal austerity is going to produce any different economic results this time around. And one would also have thought that the time has long since passed for the Greek government to start seriously exploring alternatives to a policy approach that offers the country the bleakest of prospects of many more years of a deepening economic depression and extraordinarily high unemployment. Normally, in the midst of a deep economic slump, countries follow countercyclical policies to extricate themselves from the slump and to avoid a downward deflationary economic spiral. They do so by some combination of fiscal policy stimulus, interest rate reduction, and exchange rate depreciation. EUROZONE DEBT: TWO MORE UXBs YOU WON’T FIND IN THE UK & US MSM. The Slog has already posted about the Venizelos Mob raiding University and Hospital bank accounts to pay off the English Law creditors with contracts that were watertight on the ‘money now please’ thing. Generalised international law is different, but only slightly so: Greece wants them to sacrifice most of their demands, but the remaining investors are rejecting any form debt restructuring. This impasse was announced by the Greek debt agency yesterday (a Sunday – fancy that) and it seems the amount at stake totals three billion euros. In the past week, the Greek government has tried to agree a rescheduling of the first 539mn euros, but the negotiations failed, following which Athens made it clear that it had no further funds available with which to repay the debt. This isn’t default, it’s insolvency. In the commercial sphere, Greece would now be subject to a simple winding up order and refused the right to trade further. But even in the rarified alternative universe of sovereign debt, payment default on the bonds under international law will trigger the usual massively leveraged obligations and derivatives. (Needless to say, it’s the Hedgies that are remaining immovable – as I predicted some weeks ago). The illegally denied default of Greece entered a dramatic new phase this afternoon with the revelation by mainstream Greek public health website Health News that, shortly before midnight on March 8th – the eve of Greece’s psi completion on Friday March 9th – on average 70% of public utility funds in varous large, interest-bearing accounts at the Bank of Greece were raided. These included most of the State’s regional hospital budgets, various universities and (it is alleged) at least one utility company. The European debt crisis is moving swiftly to the next phase following the downgrade of France and the collapse of the Greek negotiations with its creditors last Friday night. It is becoming increasingly obvious that there will be no deal in Greece. This is good news because it means the end of the pass-the-parcel-ponzi-scheme, whereby the bill for more and more institutional debt was passed on to more and more innocent people who had nothing to do with the debt in the first place. Greece will default – as it should. The bondholders will get roasted – as they should – for making bad investments. The laws of capitalism will be allowed to do their thing. Debtors and creditors will pay – as they both should – with both parties sharing the cost. Whether this leads to Greece being pushed out of the euro remains to be seen. An opportunistic play by a desperate Greek government might be a total default, followed by the reintroduction of a new currency and then the restart button is hit. Initially, it would be an international pariah, but over time it would recover. Last November I approached the Bank of Ireland for a loan to purchase a commercial building just off Dame Street in Dublin .The purchase price would be around 800,000 Euro of which I was prepared to put up 200,000 cash so I would be needing 600,000 thousand euro .The Building has 150,000 rental income .The current owners are in up to their necks in Debt to an English bank I believe for 4.5 million euro and the English bank wants out at any cost ,hence the price tag of 800,000 Euro .The bottom line is the bank told me that I was not going to get the loan as they themselves do not have the money. I am now living in Lubeck in Germany and a GERMAN friend who works at a local company on an adverage wage, has just taken out a loan to buy a property in one of the best retail streets in the town it is a huge old building and he bought it for 200,000 Euro he is going to put another 100,000 into it and I can say that he will do very well out of it. I will be helping him to renovate the building for the next year. I am currently looking for my own opportunity but the point is I will have an opportunity to do something as the German banks are still business friendly. Not to mention the prices for property here are far more realistic. Ireland and her banks have a long way to go before they reach rock bottom! accept it, Fitch Ratings said in a statement today. region’s rescue fund to 1 trillion euros ($1.4 trillion).